Department of Chemistry, Mount Carmel College, Palace Road, Bangalore - 560052, Karnataka, India. ABSTRACT: A recent surge of lifestyle disorders such as obesity, Type II Diabetes Mellitus and cardiovascular diseases, has led to a search of dietary changes that could be adopted into the daily lifestyle to prevent these lifestyle disorders. A nutraceutical is an upcoming option that has garnered a lot of attention and has warranted a lot of research. Green coffee beans are unroasted coffee beans which have high levels of antioxidants and caffeine thus making it a potential nutraceutical against Type II Diabetes Mellitus and obesity. In this study, water-soluble brews of caffeinated and decaffeinated green coffee beans were used to evaluate the ability of these extracts to alter the viability of muscle cells of Sus scrofadomesticus and also their effects on cortisol-induced (stress) hepatocytes by ex-vivo studies. The green coffee bean extracts were found to have low cytotoxicity. These extracts also highly controlled the release of glucose and regulated the gluconeogenic pathway by regulating glucose synthesis induced by cortisol in Sus scrofadomesticus hepatocytes when compared with the standards. INTRODUCTION: Coffee is a highly consumed beverage brewed from the beans of the Coffea plant. It is the second most consumed beverage worldwide 1. It is characterized by its distinct aroma and flavor and is served either as a hot beverage or cold. Coffee consists of a myriad mixture of biologically active substances. The revitalizing effect that coffee is known for is contributed by the psychoactive alkaloid, caffeine. There are 80 different species that belong to the genus Coffea but the two commercially grown varieties are Coffea arabica, commonly called Arabica coffee, and Coffea caphenora, commonly called Robusta coffee. Both the varieties are famous for their distinct differences in aroma, taste and caffeine content. By the time the coffee reaches the consumer, it undergoes many processing steps from harvesting, pulping, drying to fermenting, roasting and grading, occasionally, decaffeination 2. Coffee consumption in India has shown a marked increase in the last few years. A recent surge of lifestyle disorders such as obesity, Type II Diabetes Mellitus and cardiovascular diseases, has led to a search of dietary changes that could be adopted into the daily lifestyle to prevent these lifestyle disorders. A nutraceutical is an upcoming option that has garnered a lot of attention and has warranted a lot of research. Nutraceuticals is a broad umbrella term that is used to describe any product derived from food sources with extra health benefits in addition to the basic nutritional value found in foods. Green tea is being used popularly as a great source of antioxidants as well as being marketed as a brew that can promote healthier body along with weight loss. The concept behind green tea is basically using minimum processing on tea leaves. The same concept was carried out on coffee beans as well, and they were processed as minimally as possible, and there was no roasting process carried out. It served as a good weight loss supplement was consequently showcased in the American TV Show, The Dr. Oz Show in 2012. After its media debut, research was carried out to detect the components in green coffee and also how to effectively use as a weight loss supplement. During this research, many other properties of green coffee extract began to be discovered. Green coffee bean extract showed anti-diabetic 3, anti-obesity 4, 5 and anti-hypertensive properties 6, 7. Angelique Stalmach et al., 2006 carried out HPLC analysis to qualitatively and quantitatively determine the anti-oxidants present in green coffee bean extract. These anti-oxidants are the compounds that give green coffee bean extract its distinct properties 8. Bong-Keunchoi et al., 2016 fed high-fat diet to mice and induced obesity in them. He then fed them green coffee bean extract to see its effects on body weight and fatty acid synthesis mechanism. They observed a marked decrease in body fat mass and relative body weight along with decreased mRNA expression levels of adipogenesis and adipocyte metabolism-related genes in adipose and liver tissues. They concluded that green coffee bean extract has an anti-obesity effect on mice. Many other animal studies were conducted, and all of them pointed towards the same conclusion. It has been suggested that it reduces the accumulation of hepatic glycerides or by inducing changes in plasma adipokine level and body fat distribution. It has possible effects on downregulation of biosynthesis of fatty acids and cholesterol, and upregulation of fatty acid oxidation and expression of peroxisome proliferator-activated receptor alpha (PPARα) in the liver 9. The anti-oxidants present in the green coffee bean extract has been said to influence intestinal glucose uptake and gastrointestinal hormone secretion. In humans, post-prandial ingestion of green coffee bean extract has shown similar effects especially the increase of Gastric Inhibitory Polypeptide secretion at the proximal region of small intestine 10, 11. The caffeine consumption via green coffee bean extract has been linked to enhanced energy expenditure. Coffee ingestion has also been associated with an increase in blood epinephrine levels. It also promotes ventilation and lipolysis if taken before exercise 12. One significant study conducted by E. Thom using chlorogenic acid enriched coffee consumption in overweight candidates showed that chlorogenic acid is highly bioavailable and is the major compound responsible for the all the properties exhibited by green coffee bean extract 13. All these studies show the anti-obesity properties of green coffee bean extract. Green coffee bean extract has also shown promising results in the alleviation of Type II Diabetes Mellitus. Most pharmacological treatments can either induce insulin secretion, or are insulin sensitizers, or can promote glucose consumption by adipose cells and skeletal tissues 14. All these properties are not exhibited by one drug. On the other hand, plant extracts containing phenolics show all of these properties. Green coffee bean extract contained a high amount of phenolics and was considered for the same 15, 16, 17, 18. Regular coffee consumption has shown a reduced occurrence of Type II Diabetes Mellitus, even though no formal proof exists on this aspect 19, 20. Similarly, coffee consumption has shown anti-inflammatory properties in post-menopausal women thus reducing the risk of cardiovascular and other inflammatory diseases. Winder WW, et al., 1997 suggested that AMPK activation might be the key to the effects of chlorogenic acid. They concluded that chlorogenic acids inhibited hepatic glucose-6-phosphatase activity and expression, reduced steatosis of the liver, amended lipid profiles, which consequently improved fasting glucose levels, glucose tolerance, insulin sensitivity, and dyslipidemia. This suggests that chlorogenic acids are the component of green coffee bean which contributes to its beneficial effects and the contradictory effect of coffee on Type II Diabetes Mellitus 21. Hypertension refers to persistent arterial high blood pressure and is a lifestyle disorder that can also be inherited. Diet control and lifestyle changes help in alleviating hypertension. Green coffee bean extract has also been proven to show anti-hypertensive effects for 24 h after ingestion in mice. Suzuki Atsushi et al., (2002) also found that the muscarinic acetylcholine receptors are involved in the hypotensive effects of green coffee bean extract. Further studies to find its hypotensive effects are being studied in-vitro and ex-vivo 6. 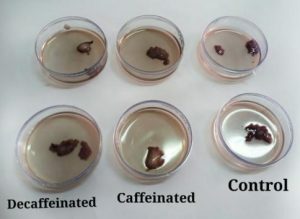 The current study attempts to evaluate the effects of the biologically active components present in the aqueous extracts of caffeinated and decaffeinated green coffee on muscle cells of Sus scrofadomesticus to check the cell viability and on stress-induced liver (using cortisol) by ex-vivo studies. The dehydrogenases and the reducing agents present in the metabolically active cells reduce the yellow aqueous solution of MTT to give formazan, a water-insoluble violet blue compound. The lipid soluble formazan product is extracted with organic solvents and is estimated spectrophotometrically. It is suggested that the intensity of the blue-violet color of the formazan is directly proportional to the amount of living cells 22. Succinate dehydrogenase of mitochondria is said to be responsible for the reduction of MTT, with the site of reduction present within the mitochondria. Consequently, the formazan precipitation site is also located within the mitochondria. This concept is used to check the viability of the Sus scrofadomesticus muscle cells. When liver hepatocytes are induced to external stress using cortisol, they release glucose molecules. Most glucose formed in the liver is not phosphorylated at the Km of liver glucokinase is high, thus the glucose is released down the concentration gradient out of the hepatocytes and into the bloodstream 23. Utilizing this property, the ex-vivo studies on hepatocytes have been carried out. Preparation of Sample Extract: Processed green coffee beans (GCB), Arabica variety was purchased from Sinew Nutrition, via e-commerce retailer, Amazon. The sample was selected via random sampling method. Caffeinated Sample: 25g of green coffee bean was flaked to obtain flakes of 1-1.5 mm. The flakes were subjected to defatting with n-hexane (1:6 w/v) by Soxhlet extraction 24. The defatted samples were then dried to reduce the moisture to 10%. The dry flakes were ground, and the fine powder form was used as raw material; a preparation of conserve. Decaffeinated Sample: Caffeine and neutral lipids were eliminated, using the direct solvent method of decaffeination. 25 g of green coffee was soaked overnight to increase moisture content. The soaked beans were treated with ethyl acetate, repeatedly washed three times for 10-15 min each. The beans were dried to bring down the moisture content to 10% and then ground to finer powder form. This is used as raw material for further studies. 1 g of the ground coffee was boiled in 100 ml of boiling water for 5 min and allowed to stand for a minute. The solution was filtered, and the filtrate is analyzed. Study of Cell Viability: The muscle cells of Sus scrofadomesticus (obtained from pork belly purchased from Bangalore Ham Shop, M G Road, Bengaluru) cultured in DMEM medium were treated with the sample extracts at a final concentration of 100 µg/mL for 48 h. After the incubation period, 5 mg/mL of MTT (3-(4, 5-dimethyl- 2- thiazolyl)- 2, 5- diphenyltetrazolium-bromide) solution (Sigma Aldrich) for a time period of 3-4 h. The color produced was observed and recorded 22. Liver Tissue Source: The liver was purchased from Bangalore Ham Shop, M. G. Road, Bengaluru. The liver tissue was rinsed with normal saline, and an approximate of 250 mg of the liver tissue was sliced and placed into eight 12-well culture plate into which 1ml of saline was added. Under these conditions, the liver cells are viable for 6 h, and the entire experiment was performed within 4 h 25. Cortisol was obtained from Jain hospital pharmacy, Vasanthnagar, Bengaluru. 100 µg of 5 µL cortisol was added to the previously taken liver and saline mixture 27. Study of Glucose Release: Estimation of glucose liberated from the hepatocytes of liver carried out using the reagent, glucose oxidase. Glucose oxidase oxidizes the glucose released to give gluconate and hydrogen peroxide. Oxidative coupling of hydrogen peroxide with 4 Amino-antipyrine (4-AAP) and phenol produces quinoeimine, a red colored dye which is measured at 520 nm. The color intensity is directly proportional to the amount of glucose released by the sample 26. The absorbance was read at 520nm using an ELISA reader against Millipore water (100 µL) as blank. Gluconeogenesis Study: The glucose released by the cortisol-induced liver is estimated using glucose oxidase reagent. The percentage of the glucose released was also estimated 26. Standard reaction mixtures were prepared as follows - (a) Liver + Saline: 2 mL of normal saline was added to the liver placed in the culture plate. (b) Liver + Saline + Cortisol: 1 mL of normal saline was added to the liver placed in the culture plates, to which 5 µL of cortisol was added. (c) Liver + Saline + Sodium Pyruvate: 1 mL of normal saline was added to the liver placed in the culture plates, to which 100 µL of sodium pyruvate (1%) was added. (d) Liver + Saline + Sodium Pyruvate + Cortisol: 1 mL of normal saline was added to the liver placed in the culture plates, to which 5 µL of cortisol and 100 µL of sodium pyruvate (1%) was added. The glucose released by the liver cells of each reaction mixture is estimated at zero minutes and after 30, 90 and 120 min respectively. 10 µL of the reaction mixture was taken in ELISA reader plate and made up to 50 µL with Millipore water. 50 µL of glucose oxidase is added to each well and the color developed was read at 520 nm 23. 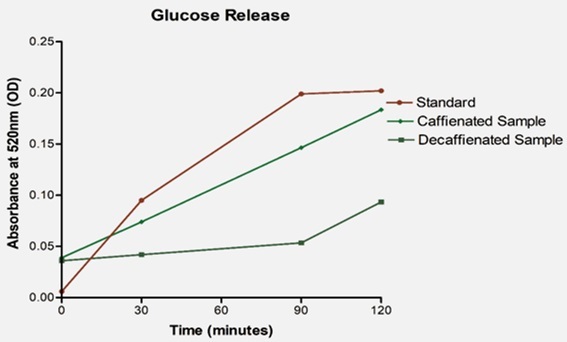 Effect of Caffeinated Green Coffee on Glucose Release: To the liver (250 mg) in the cell culture wells, caffeinated green coffee (1000 µL), saline (1000 µL), and 5 µL of cortisol was added. The glucose released by the liver cells is estimated at zero minutes and after 30, 90 and 120 min. 10 µL of the reaction mixture was taken in ELISA reader plate and made up to 50 µL with Millipore water. 50 µL of glucose oxidase is added to the well and the color developed was read at 520 nm. Comparative studies were performed on the effects of the caffeinated green coffee extract on glucose release and was compared to the standard parameters 23. 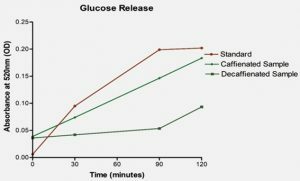 Effect of Decaffeinated Green Coffee on Glucose Release: To the liver (250 mg) in the cell culture wells, decaffeinated green coffee (1000 µL), saline (1000 µL), and 5 µL of cortisol was added. The glucose released by the liver cells is estimated at zero minutes and after 30, 90 and 120 min. 10 µL of the reaction mixture was taken in ELISA reader plate and made up to 50 µL with Millipore water. 50 µL of glucose oxidase is added to the well and the color developed was read at 520 nm. Comparative studies were performed on the effects of the decaffeinated green coffee extract on glucose release and were compared to the standard parameters 23. Effect of Caffeinated Green Coffee on Gluconeogenesis: To the liver (250 mg) in the cell culture wells, caffeinated green coffee (1000 µL), saline (1000 µL), sodium pyruvate (100 µL) and 5 µL of cortisol was added. The glucose released by the liver cells is estimated at zero minutes and after 30, 90 and 120 min. 10 µL of the reaction mixture was taken in ELISA reader plate and made up to 50 µL with Millipore water. 50 µL of glucose oxidase is added to the well and the color developed was read at 520 nm. Comparative studies were performed on the effects of the caffeinated green coffee extract on glucose release and were compared to the standard parameters 23. 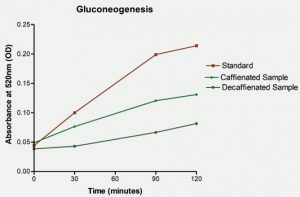 Effect of Decaffeinated Green Coffee on Gluconeogenesis: To the liver (250 mg) in the cell culture wells, decaffeinated green coffee (1000 µL), saline (1000 µL), sodium pyruvate (100 µL) and 5 µL of cortisol was added. The glucose released by the liver cells is estimated at zero minutes and after 30, 90 and 120 min. 10 µL of the reaction mixture was taken in ELISA reader plate and made up to 50 µL with Millipore water. 50 µL of glucose oxidase is added to the well and the color developed was read at 520 nm. A comparative study was performed on the effects of the decaffeinated green coffee extract on glucose release and was compared to the standard parameters 23. Cell Viability Assay: After incubation period with MTT, the muscle tissues took up a dark violet-pink color indicating formazan precipitation. The amount of color developed is directly proportional to the viability of the muscle cell. The treatment of muscle tissues with green coffee conserves under ex-vivo conditions, rendered near dark violet-pink coloration in comparison to the control cells that were untreated as seen in Fig. 1. Both decaffeinated and caffeinated showed equal color intensity, which goes to show that green coffee increases mitochondrial activity and has low cytotoxicity. This concludes that green coffee can help to maintain energy homeostasis for an extended period. 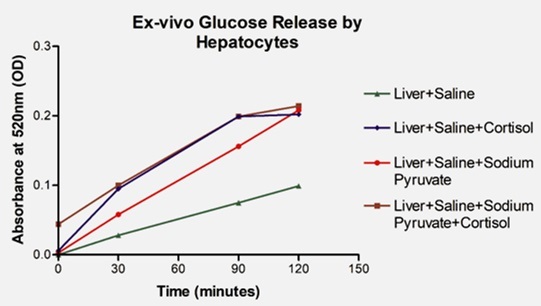 Ex-vivo Studies on Glucose Release by Hepatocytes: The liver tissue placed in saline showed a stable increase in the absorbance suggesting the synthesis of glucose by the hepatocytes as seen in the graph Fig. 2. Addition of sodium pyruvate showed an even greater increase in the measure of released glucose. Inducing the liver tissue with cortisol increased the release of glucose to drastic heights. This is indicative of the liver being under stress and synthesizing glucose by Gluconeogenesis metabolic pathway. Sodium pyruvate is a precursor for gluconeogenesis because of which the hepatocytes synthesize glucose at an increased rate. Cortisol is a stress hormone which puts the liver under great stress to release increased amounts of glucose. This suggests that gluconeogenesis is a major stress marker and increased stress is directly proportional to the percentage of glucose synthesized. Therefore, stress conditions like prolonged starvation, extreme physical exercises and stress deplete the blood sugar level inducing liver to synthesize glucose from non- carbohydrate moieties. Cortisol-induced liver along with sodium pyruvate showed the maximum release of glucose in comparison to the liver induced by cortisol alone. A similar difference was seen between the liver tissue in normal saline and liver tissue with added sodium pyruvate, where the latter showed higher glucose synthesis. A similar study showed the switch to gluconeogenesis on the addition of sodium pyruvate leading to increased synthesis of glucose (Friedmann B et al., 1967). Effect of Green Coffee on Glucose Release by Cortisol Induced Liver: The liver cells induced with cortisol were treated with green coffee extracts to see the extent of the effect it has on cortisol activity. It was measured regarding glucose released by the hepatocytes under ex-vivo conditions. As seen in graph Fig. 3, the caffeinated green coffee brew initially showed higher glucose release; further down the given period the liver showed decreasing glucose release at 30, 90 and 120 min in comparison to the control liver. The liver cells treated with decaffeinated green coffee brew showed a drastic decrease in the amount of glucose released by the hepatocytes at 30, 90 and 120 min. The decrease in glucose released in comparison to the control and caffeinated counterpart is paramount Fig. 4, meaning the synthesis of glucose by the hepatocytes is markedly controlled, and the activity of cortisol is inactivated to a great extent. Effect of Green Coffee on Gluconeogenesis: The effect of caffeinated and decaffeinated green coffee on the liver, induced with cortisol and with added sodium pyruvate were compared and noted. As seen in the graph Fig. 4, the caffeinated green coffee brew lowered the glucose released by the hepatocytes induced with cortisol plus sodium pyruvate in decreasing amounts at 30, 90 and 120 min, in comparison to the control. The decaffeinated green coffee brew showed a showed drastic decrease in the amount of glucose released by the hepatocytes at 0, 30, 90 and 120 minu. The difference in glucose release by the decaffeinated preparation is tremendous about the caffeinated brew and the control. 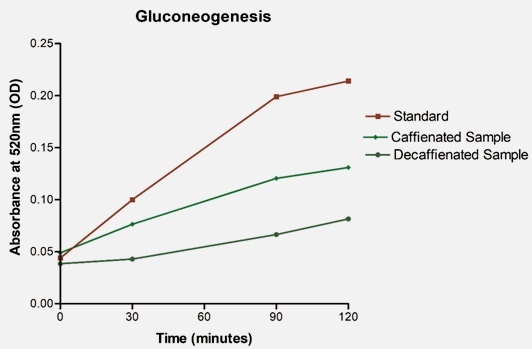 Thus, it can be concluded that the decaffeinated coffee brew inhibits the gluconeogenic pathway to a vast degree and also cortisol activity, thereby regulating glucose synthesis by liver under stress. ACKNOWLEDGEMENT: The authors would like to acknowledge the Department of Chemistry (PG Biochemistry) and the management of Mount Carmel College Autonomous, Bengaluru, for backing this project and providing their facilities for the study. Pendergrast and Mark: Uncommon Grounds: The History of Coffee and How It Transformed Our World. New York: Basic Books 1999. ISBN 978-0-465-03631-8. Farah A: Coffee: Emerging Health Effects and Disease Prevention. 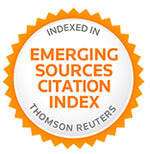 John Wiley & Sons Inc 2012. Johnston KL and MN: Coffee acutely modifies gastrointestinal hormone secretion and glucose tolerance in humans: glycemic effects of chlorogenic acid and caffeine. American Journal of Clinical Nutrition 2003; 78: 728-733. Dam VR and WM: Coffee, caffeine, and risk of type 2 diabetes: a prospective cohort study in younger and middle-agedS. women. Diabetes Care 2006; 29: 398-403. Flanagan J and AB: Lipolytic Activity of Svetol®, a Decaffeinated Green Coffee Bean Extract. Phytotherapy Research 2014; 28: 946-948. Suzuki A and DK: Green coffee bean extract and its metabolites have a hypotensive effect in spontaneously hypertensive rats. Hypertension Research 2002; 25: 99-107. Ochiai R and HJ: Green coffee bean extracts improves human vasoreactivity. Hypertension Research 2004; 27: 731-737. Stalmach A and WM: On-line HPLC analysis of the antioxidant activity of phenolic compounds in brewed, paper-filtered coffee. Brazilian Journal of Plant Physiology 2006; 18(1): 1-3. Choi BK, SB, PR and YW: Green coffee bean extract improves obesity by decreasing body fat in high-fat-diet-induced obese mice. Asian Pacific Journal of Tropical Medicine 2016; 9: 635-643. Welsch CA and PL: Dietary phenolic compounds: inhibition of Na+-dependent D-glucose uptake in rat intestinal brush border membrane The Journal of Nutrition 1989; 119(11): 1698-704. Shimoda HE: Inhibitory effect of green coffee bean extract on fat accumulation and body weight gain in mice. BMC Complementary and Alternative Medicine 2006; 6: 1-9. Greer F and HR: Caffeine ingestion decrease glucose disposal during a hyperinsulinemic-euglycemic clamp in sedentary humans. Diabetes 2001; 50: 2349-2354. Thom E: The effect of chlorogenic acid enriched coffee on glucose absorption in healthy volunteers and its effect on body mass when used long-term in overweight and obese people. 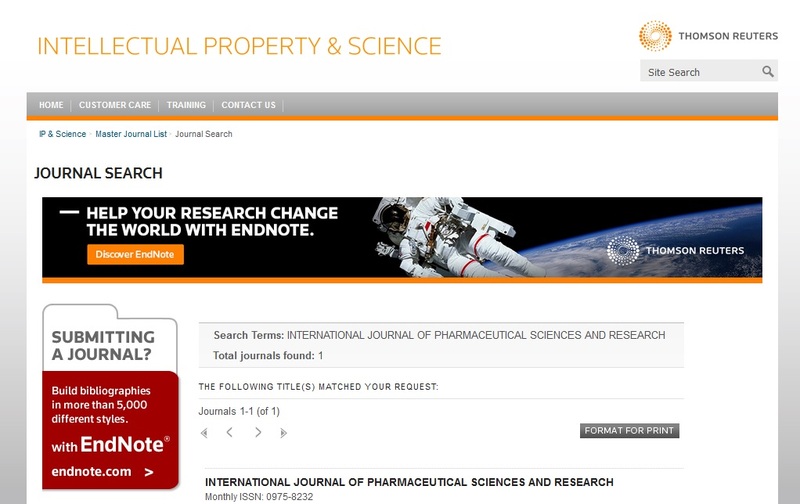 The Journal of International Medical Research 2007; 35: 900-908. Cheng AYY and IF: Oral antihyperglycemic therapy for type 2 diabetes mellitus. Candian Medical Association Journal 2005; 172: 213-226. Nardini M and MD: Inhibition of human low-density lipoprotein oxidation by caffeic acid and other hydroxycinnamic acid derivatives. Free Radical Biology and Medicine 1995; 19: 54-552. Arion WJ and WC: Chlorogenic acid and hydroxynitrobenzaldehyde: new inhibitors of hepatic glucose 6-phosphatase. Archives of Biochemistry and Biophysics 1997; 339: 315-322. Hsu FL, YC and CT: Caffeic acid as active principle from the fruit of Xanthium strumarium to lower plasma glucose in diabetic rats. Planta Medica 2000; 66(3): 228-230. Hemmerle H and HB: Chlorogenic acid and synthetic chlorogenic acid derivatives: novel inhibitors of hepatic glucose-6-phosphate translocase. Journal of Medical Chemistry 1997; 40: 137-145. Bidel S and GH: Effects of coffee consumption on glucose tolerance, serum glucose and insulin levels: a cross-section analysis. Hormone and Metabolic Res 2006; 38: 3-43. Higdon JV and Frei B: Coffee and health: a review of recent human research. Critical Review of Food Science and Nutrition 2006; 46: 101-123. Winder WW and HD: AMP-activated protein kinase, a metabolic master switch: possible roles in type 2 diabetes. American Journal of Physiology 1999; 277: 1-10. Johan van Meerloo GJ: Cell Sensitivity Assays: The MTT Assay. Methods in Molecular Biology 2011; 731, 237-245. Kavitha G and Singh JJ: The reduction in the cortisol-induced stress markers of Clerodandrum colebrookianum. International Journal of Pharmaceutical Sciences and Research 2017; 8: 3591-3598. Upadhyay R and KR: Microwave-assisted extraction of chlorogenic acids from green coffee beans. Food Chemistry 2012; 130: 184-188. Olinga P: Precision-cut liver slices: A tool to model the liver ex vivo. Journal of Hepatology 2013; 58: 1252-1253. Gochman N, Ryan WT, Sterling RE and Widdowson GM: Interlaboratory comparison of enzymatic methods for serum glucose determination. Clin Chem 1975; 21(3): 356-361. Singh KG, Lad SA and Khawas BD: The effect on cell viability and reduction of cortisol activity by aqueous extracts of green coffee bean. Int J Pharm Sci & Res 2019; 10(2): 795-01. doi: 10.13040/IJPSR.0975-8232.10(2).795-01.